If you want to know where gold prices could be headed next, you must look at the charts. And right now, those charts are currently painting a very bullish outlook for the yellow precious metal. There are three charts worth watching at the moment. In 2018, gold prices formed a technical analysis chart pattern called a “cup and handle.” It’s drawn on the chart below. A cup and handle pattern forms when prices trade in a “u”-shaped pattern, and followed by a slight downward drift at the end. Technical analysts consider this a bullish pattern. Once this pattern forms, technical analysts wait for the price to trade out of that downward drift and then buy. Keep in mind that with every chart pattern, there are targets. With a cup and handle pattern, after the price breaks out of the drift, the target is set by measuring the distance between the right peak and the bottom of the cup, and then adding it to the breakout point. In this case, the distance from the peak and the bottom of the cup is around $168.00. Assuming a breakout point of $1,320, this chart pattern says gold prices could go as high as $1,488. This pattern forms when there’s a prevailing uptrend, but there’s a consistent resistance. Once the price breaks out above resistance, it’s bullish and could result in solid gains. This chart shouldn’t be new to long-term readers of Lombardi Letter, having been mentioned several times in these pages. Technical analysts set targets with this chart pattern by measuring the widest part of the triangle and then adding it to the breakout point. In this case, the widest part of the ascending triangle is the price action between December 2015 and July 2016; it’s about $300.00 wide. The major resistance level is around $1,375. 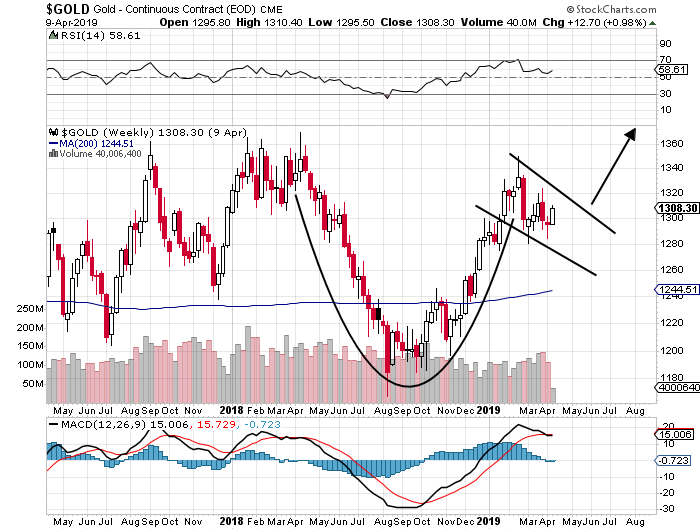 According to this chart, if gold prices are able to break above the resistance level, they could reach as far as $1,675. Pay close attention to the red line plotted on the chart below. It’s the 200-month moving average. Gold prices remain well above it. This means that the long-term trend remains intact. Keep in mind that the trend is your friend. 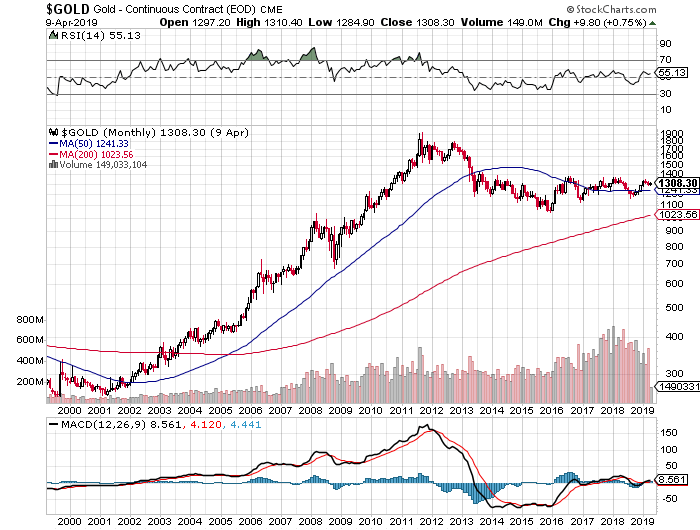 And trends continue for a long time, so a long-term one implies that gold prices could continue to move higher. Looking at these charts, I can’t help but be bullish. However, I continue to watch one big level on gold prices: $1,375. Over the past five years, gold prices haven’t been able to break above this level. I believe there are a lot of sellers at this level and that they have been a major force keeping gold prices low. 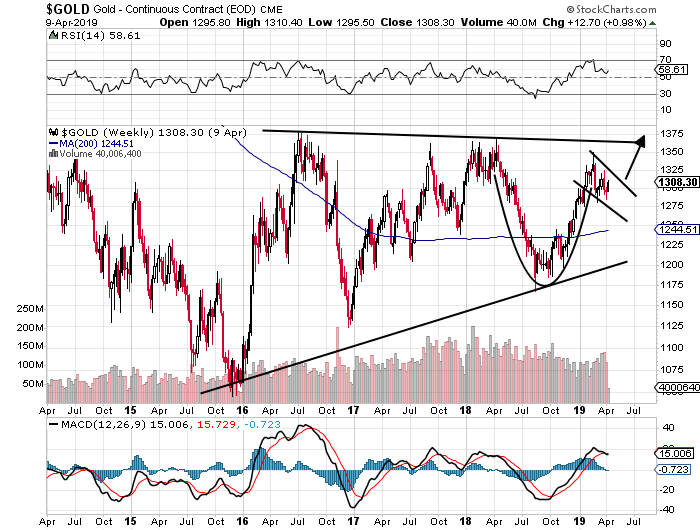 Once the price breaks above $1,375, we could really see fireworks in the gold market.